"Come across the street with me." We were eating dinner at one of our favorite Chinese places in Chinatown (no, I'm not going to say where), when Guy asked me to step outside with him for a minute before our hotpot arrived. We walked across the street, stopped at the bank to pick up some cash, and then came face to face with the monster. "I have to eat it." "it" was the beady-eyed something staring back at us through the glass. "it" had claws that looked as if they could take out a small dog. "it" was a 12-pound Canadian Emperor Crab. Plans within plans, at least for the following Saturday night. "So, how many people do you think that feeds?" "I think not as many as you think." "Maybe five... it's mostly shell." "I bet it could feed ten, with other stuff." Ten turned to nine turned to eight turned to six turned back to seven. We sat, we had some beer. There was a giant lazy susan in the middle of the table. "So, how many people are coming?" "And how much does this cost again?" "You realize, for this much money, we could have all gone to Luger's and had the best meat in the world." "Yeah, but we've done that before." Tense negotiations followed. Did we really want to go through with this? Did we feel morally okay with this? Did we have a choice? They'd kept one on hold just for us. In the end, we decided to go for it. 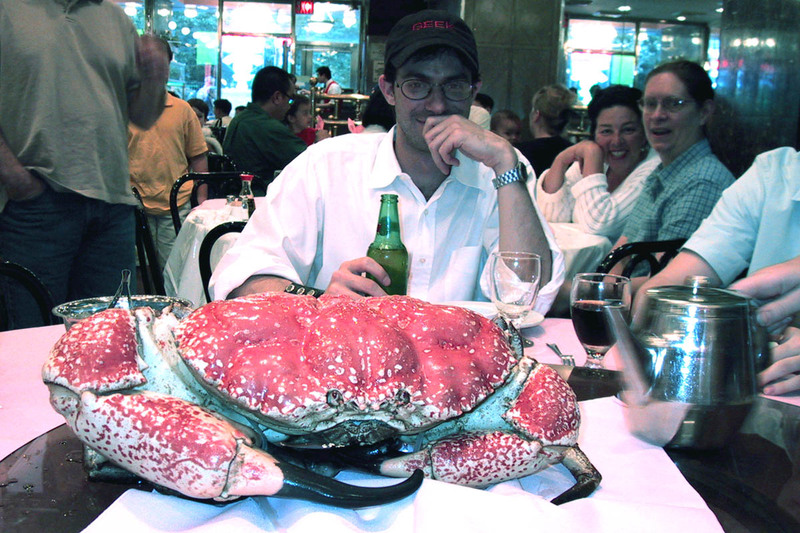 The waiter brought the crab out and sat it on the table, so we could, as it were, sniff the cork. Everything seemed in order. "How's the crab actually prepared?" "We take half and sautee it in gingergarlic sauce, and the other half steamed in garlic with noodle." "That sounds just fine to us." I should point out, right now, before you get too excited, that this is really the climax of the story. We ate the crab, and that's about it. It wasn't really worth it. Except for the pictures, of course. Oh, and Guy doesn't get to pick any more restaurants for a while.